Bob and Gracie Ekblad are founders and General Directors of Tierra Nueva. They pastor and teach locally and internationally, bridging divergent worlds inside and outside of the Church. Their calling is to help recruit, equip and empower people to communicate good news about God’s love that combines Word, Spirit and Street perspectives at the service of people on the margins. Click here to support the Ekblads’ ministry at Tierra Nueva. Kevin and Danielle are involved the life of our community of Tierra Nueva and doing outreach to the wider community. They are both trained relapse prevention counselors with the Genesis Process. Danielle is the Lead Women's Advocate, Director of Children’s Ministry, and the Director for Women’s Chaplaincy at Skagit Community Justice Center. 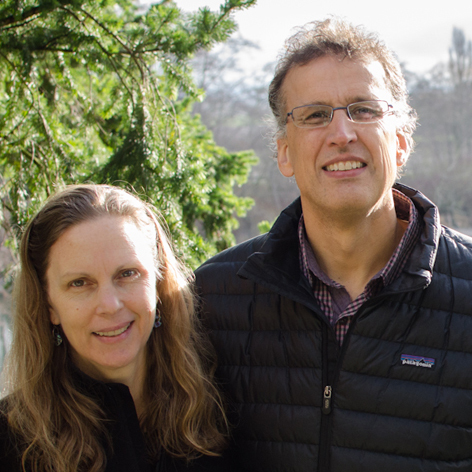 Kevin was commissioned by Presbytery as Head Pastor of Mount Baker Presbyterian in 2018 and regularly delivers the message at Tierra Nueva, where he is a Pastoral Advocate. They learned of Tierra Nueva while living on the street and serving time in jail. Kevin has graduated from New Earth Recovery’s Trust program. They have been so moved by the integrity and love in this ministry, they have decided to become a part of it. Click here to support Kevin and Danielle’s ministry at Tierra Nueva. Matt is a chaplain in the Skagit County Community Justice Center, and a Reader in the Greek Orthodox Church. He holds an MFA from the University of British Columbia, and is the founding Director of Underground Writing, a literature-based creative writing program serving incarcerated, migrant, addiction recovery, and other at-risk communities in Northern Washington through literary engagement and personal restoration. Click here to support Matt’s ministry at Tierra Nueva. As Executive Director, Mike “pastors the pastors” in all levels of leadership through staff development, discipleship, and executive leadership. Mike also helps lead our faith community in worship, teaching, and prayer ministry; and partners with various staff in their areas of calling. Mike is passionate about all people encountering God's goodness and experiencing healing, restoration, transformation and empowerment. Click here to support Mike’s ministry at Tierra Nueva. Andrew joined Tierra Nueva in 2019 upon completing his Master of Divinity from Princeton Theological Seminary. He serves in the Jail Ministry and Worshiping Community. Andrew first came to know Tierra Nueva growing up in Western Washington. While doing ministry in Latin America (Guatemala and Brazil), the idea of working with Tierra Nueva became stronger and clearer and he is stoked to finally be a servant in the community. Click here to support Andrew’s ministry at Tierra Nueva. Julio is a pastor and the doorkeeper at Tierra Nueva. He also serves in our Family Support Center welcoming and assisting families who come through our doors. A former gang member, his passion is working with gang members and people in recovery. Salvio and Victoria work in the Family Support Center offering accompaniment, legal advocacy, translation, assistance and home visitations. They love going to people's homes to read the Bible, praying for--and with--others and praising God. They love to see God transform lives through God's Word. Click here to support Salvio and Victoria’s ministry at Tierra Nueva. Alvin is the Office and Communications Administrator. His heart is for transformation, justice, storytelling, sharing good food, and efficient organizations. At his position at Tierra Nueva, he gets to do most of those things in celebrating Christ's love for His people. Most of his work involves equipping our front-line staff and pushing Tierra Nueva further in organizational transparency and efficiency. Click here to support Alvin’s ministry at Tierra Nueva. Elise is the bookkeeper at Tierra Nueva. Both Elise and Carmen from Carmen’s Bookkeeping have grown up in Skagit Valley and have enjoyed watching the ministry, love and outreach that Tierra Nueva offers to this community.